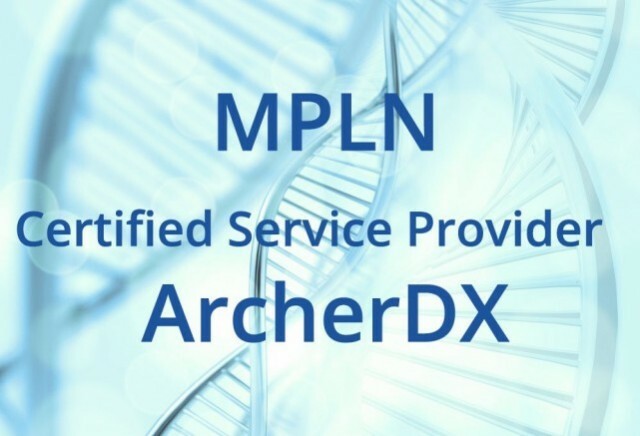 Boulder, COLORADO – ArcherDX, Inc., has announced that Molecular Pathology Laboratory Network, Inc. (MPLN) is now a Certified Service Provider of Archer® FusionPlex® NGS assays. MPLN will offer a custom sarcoma analysis service that includes the FusionPlex Sarcoma NGS assay as part of their services to customers in the biotechnology and pharmaceutical industries. MPLN offers molecular anatomic pathology testing for hematologic cancers and solid tumors along with genetic and women’s health testing to oncologists, pathologists, hospitals and reference laboratories. MPLN’s clinical trials division Genuity® CRS also services pharmaceutical and medical device companies along with contract research organizations (CROs) across the United States and Europe. MPLN is CLIA-certified, CAP accredited and licensed by New York State. MPLN was the seventh lab in the USA to become ISO-15189 accredited, a quality management system metric that provides the company the global infrastructure to perform analyses worldwide. ArcherDX addresses the bottlenecks associated with using NGS in oncogenic mutation detection by offering a robust platform for targeted sequencing. By combining proprietary AMP™ chemistry with easy-to-use, lyophilized reagents, Archer NGS assays generate highly enriched sequencing libraries to detect gene fusions, point mutations, CNVs and RNA abundance. Complemented by powerful bioinformatics software, ArcherDX technology dramatically enhances complex mutation identification and discovery. Archer®, FusionPlex® and AMP™ are trademarks of ArcherDX, Inc.
About Molecular Pathology Laboratory Network, Inc.
MPLN specializes in molecular anatomic pathology, genetic and women’s health testing. MPLN combines highly qualified physicians, scientists and innovative technologies with unparalleled service to meet diagnostic challenges in a timely, cost-effective manner. Geneuity, a division of MPLN, provides outsourced specialty lab testing services for drug discovery and companion diagnostics for pharma, biotechnology, CROs and medical device companies. MPLN and Geneuity provide an expanding menu of molecular diagnostics, specialty anatomic pathology, flow cytometry, and cytogenetic testing to clinical clients in pathology groups, hospitals, medical laboratories and physician groups nationwide as well as biopharma, CROs and medical device companies globally. Experienced in outsourced specialty testing and device validation, the expert clinical and scientific staff also provides consultative services to protocol review and biomarker selection. MPLN is an ISO15189- and CLIA-certified, CAP-accredited high complexity laboratory that is headquartered in Maryville, Tennessee. Geneuity® is a registered trademark of MPLN. Learn more at mplnet.com and geneuity.com.